Recently many products containing peanut butter have been recalled. Diabetes drug use doubles in 2 years; in children! America’s tweens and teens more than doubled their use of type 2 diabetes medications between 2002 and 2005, with girls between 10 and 14 years of age showing a 166 percent increase. One likely cause: Obesity, which is closely associated with type 2 diabetes. “The human body is a complex organism with the ability in most cases to heal itself – if only you listen to it and respond with proper nourishment and care.” ~ Introduction, Prescription for Nutritional Healing by James and Phyllis Balch. Recently we had roasted breadfruit at Ross Campus and the students really loved it. One student took it home and told me she was enjoying it days later! I first tasted breadfruit while traveling through the Caribbean studying vegetarian cooking in the late 1970’s and early 1980’s. Each island I visited had a wide range of recipes for utilizing the breadfruit; my favorite was the roasted breadfruit; but close behind was a delicious vegetarian calallu (spinach) ital with coconut gravy and breadfruit pieces. It was so common on all the islands; I found it hard to believe when I discovered it was not indigenous to the Caribbean area. Rather this incredible tree originated in the South Pacific, and is thought to have been introduced to the West Indies in the 1700’s. 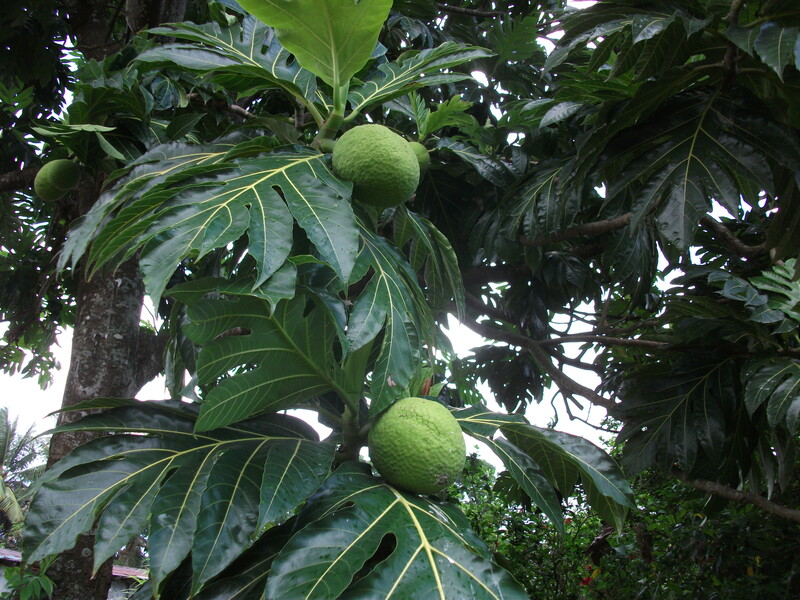 Breadfruit and the other provisions traditionally eaten throughout the Caribbean; are the most healthy, ecological way to get the complex carbohydrates we need; equivalent to the whole grains of Europe and North America. Respect to Shannah Robin; a long time promoter of healthy living in Dominica. Shannah offers classes in martial arts and yoga; addressing the needs of both children and adults in his programmes. Living the lifestyle as well; Shannah has recently received his 3rd black belt. I have watched the effect his programme has on children and I am impressed with his skill in encouraging focus and concentration in his students……….nuff respect. In 1998 Dr. Dean Ornish released a study in the Journal of the American Medical Association showing that it was possible for heart disease to be not only prevented but REVERSED through comprehensive lifestyle changes. In 2002 Dr. Ornish stated in an interview that he was disappointed that the medical association was not taking this study further. Well it was just a matter of time. Now the home page on the American Heart Association Website is all about healthy lifestyle. In 1997, Highmark Blue Cross and Blue Shield of Pittsburgh, PA became the first health insurer in the country to provide the Dr. Dean Ornish Program for Reversing Heart Disease as a covered benefit for its members. Thanks to Dr. Ornish this is now a mainstream concept. Markets for organic produce and products are growing; according to an IFOAM document presented at the Ecological Farm Conference in January 2008 called Global Statistics of the Organic Market; global sales of organic food and drink have increased by 42% between 2002 and 2005 and experts are predicting organic markets to grow even faster in the next few years. Just having returned from working in the health food industry in Canada; I saw with my own eyes that the growth of organic products has been tremendous in the last 10 years. When volunteering at the Toronto Vegetarian Fair; one of the largest Vegetarian Fairs in North America I walked around the food distributors booths. When I told them where I was from many asked me what organic products we had as an island; especially asking for chocolate. French bees find a haven in pesticide free Paris. Natural Expo Japan Besides the host country Japan, there was a particularly strong presence of exhibitors from Germany, Austria, Australia, Mexico and Thailand this year. Newcomers in 2008 were Costa Rica, Madagascar and New Zealand. Sales of organic products are still increasing in Italy. DOAM: Dominica Organic Agriculture Movement.